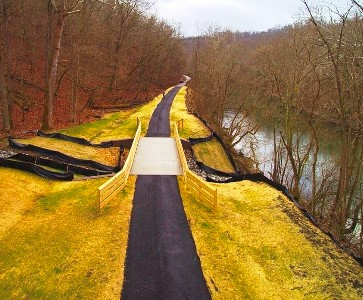 Did you ever wonder where improvements to the trail come from? While you have no doubt seen volunteers from Friends of the Little Miami State Park (FLMSP) on the trail clearing and cutting, where does the funding come from to maintain the infrastructure, e.g. culverts, bridges, riverbanks, and paving? Well, here’s the inside story. On June 11, 2014 in Loveland, Jim Zehringer, Director of ODNR, announced an $88.5 million capital appropriation for the 74 Ohio state parks—an average of a little less than $1.2 million per park. However, the Little Miami State Park received $3.5 million. 1. ODNR engaged the consulting services of KZF to develop a Little Miami Trail Improvement Plan. All KZF consulting services are paid out of the 2014 $3.5 million capital appropriation. 2. Shawnee Run culvert collapse. Cost of project $572,500 paid out of the 2014 $3.5 million capital appropriation. 3. Ft Ancient Riverbank Stabilization Phase I. A bridge was constructed from one stable portion of the bank to another. Cost of Phase I of the project $529,575 paid out of the 2014 $3.5 million capital appropriation. 4. In 2015, 1.3 miles of the trail were paved from the Milford trail head north and .3 miles were paved in Camp Dennison. Cost of project $178,000. This project was paid for by a $150,000 Recreational Trails Program (RTP) grant and $38,000 from FLMSP in matching funds. It should be noted that the availability of the RTP grant was identified by ODNR; FLMSP’s role was to raise the $38,000 in matching funds (which FLMSP did in 18 days in October 2013). 5. In 2017, 8.0 miles of the trail were paved from Loveland’s O’Bannon Creek south to Camp Dennison. Cost of project $947,980. This project was paid for by a Land and Water Conservation (LWCF) grant of $380,610 and $567,370 from the 2014 $3.5 million capital appropriation. For the record, ODNR’s Martin McAllister created and submitted the LWCF grant application; FLMSP’s role was to identify the section of the trail to be repaved (i.e. Loveland’s O’Bannon creek bridge to Camp Dennison) and prepare the trail for paving. Of the original $3.5 million capital appropriation announced in June 2014, $2,050,055 has already been spent, i.e. items 2, 3, and 5 above; item 1 is unknown at this time. What remains of the original $3.5 million? $1,449,945. How much more capital appropriation does the KZF Little Miami Trail Improvement Plan call for? FLMSP has been able to preview the final draft of the Little Miami Trail Improvement Plan. The plan identifies 13 priority repair and maintenance projects, with totals estimated in the millions of dollars, with additional millions needed for desired improvement projects. These are some sobering numbers. Why are they so high? Paving. 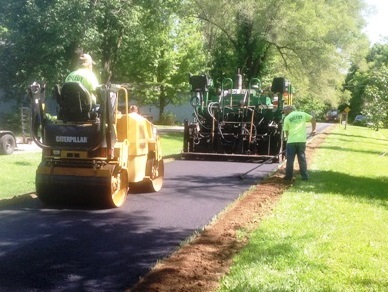 Repaving a mile of trail costs about $80,000 per mile. So, to repave the remaining 40.4 miles of the trail is $3,232,000—but this $80,000 per mile assumes that the trail surface is ready to be paved with culverts, bridges, and riverbanks being brought up to spec. Culverts. To date, we have identified 201 culverts. Culverts are critical to the integrity of the trail as they allow water to pass under the trail rather than through the trail ballast or over the trail. The oldest section of the trail (from Loveland to Morrow) was completed in 1983. That means the Loveland to Morrow culverts haven’t been maintained in over 34 years. Some culverts are partially clogged, some completely clogged, and some need to be replaced. The cost to replace a culvert is usually in the neighborhood of $5-15,000, although the cost to repair/replace a given culvert can soar, e.g. the $572,500 cost to repair the Shawnee Run culvert. Bridges. There are 15 wooden bridges along the 50 miles of the trail. Back in 2009-2010, prompted by the number of accidents that were occurring, FLMSP paved over the wooden decking on all the bridges. Now that decking needs to be replaced, and the bridges stabilized and repaved. Riverbank Stabilization. The Little Miami River is both a state and national scenic river—one of just a few such rivers in the country. It therefore has special status. As it wends its way through the valley it gets to go wherever it wants to go and if, as a result, the trail is undercut or threatened in any way, our remediation options are limited. The $800,000 Phase I Ft Ancient riverbank stabilization project is a prime example of how the trail needs to accommodate the river. As you drive east along US Route 52 you will notice several locations where the Ohio River has undercut and threatened the roadway; the solution was to drive pilings into the riverbank. The “piling” option is not available for the Little Miami River; nothing can be put into the river to stabilize the bank. Examples are the Ft Ancient “bridge” and the Spring Valley trail reroute. Every situation is different. Regulatory Approvals. Did you know there are mussels (an endangered species) in the Little Miami River? That there are specific do’s and don’ts within 1,000 feet of a State and Federal Scenic River? Thus, gaining the necessary regulatory approvals from organizations like State Scenic Rivers, Federal Scenic Rivers, Army Corps of Engineers, National Parks, EPA, etc., can be a long and expensive process. So, what is FLMSP’s plan? The State of Ohio develops and approves its capital appropriation budget ever two years. The next capital appropriation budget is due to be submitted and approved on or before June 30, 2018.Therefore, our plan is to mobilize ourselves to influence that capital budget appropriation in our favor. That grassroots mobilization will require support from our members, our Trail Mail recipients, the various businesses and jurisdictions that benefit from the trail, and the 1.2 million visitors who visit the trail each year. We will let you know when and how you can participate in this mobilization. article by Steve Murphy, former FLMSP President, with data contributed by Ohio Dept. of Natural Resources.